Piers Anthony is one of those genre writers that I had heard of when getting into Fantasy and Science-Fiction, but I hadn't really had the chance or inclination to pick up any of his series, as much because it's difficult to know where to start with such a prolific author. 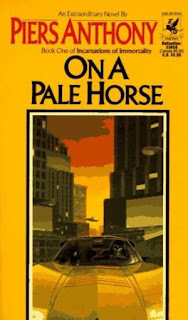 But as On a Pale Horse appeared in, you guessed it, a bundle that I had picked up, it seemed the perfect place to start. Besides, who doesn't like a good Grim Reaper story? 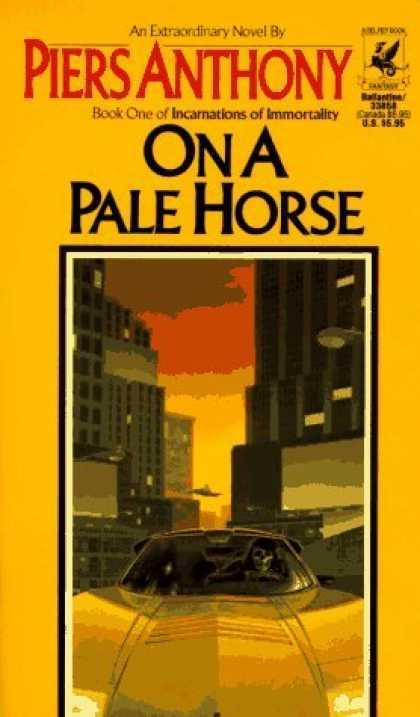 On a Pale Horse follows Zane, a man who, after a spectacularly bad day topping off a life of guilt and failure, decides to kill himself. When he goes to pull the trigger, he is confronted by the Grim Reaper. In a moment of horrified panic and a sudden renewed desire to live, he turns the gun on Death, and kills him. Moments later, he meets the anthropomorphic manifestation of Fate and is told that he must take over the position of Grim Reaper, and gather the souls of those whose destination in the afterlife is uncertain. On top of trying to figure out his new powers and responsibilities on the job, he finds that his appointment may be tied into a vast conspiracy by Satan. I love a good pantheon, and On a Pale Horse looks to be the start of a pretty good one. It was kind of an intriguing set-up, combining your traditional Abrahamaic God vs Satan narrative with five semi-immortal figures acting as manifestations of themes with particular importance in human society: Death, Time, Fate, War and Nature. As God and Satan are prohibited from interfering directly with life on Earth, the Incarnations are there to ensure that both of them stick to the rules of engagement. While the interactions between the Incarnations was somewhat limited, it was great to see the duplicity and scheming that was already present. The problem that I've seen with a lot of pantheons is that the deities within tend to fall into either good or evil camps and then their characters are more or less defined by their moral compass and not by their personal sphere of influence or any other personal nuance. While on the subject of the world-building, the mortal world is also pretty nicely fleshed out. It tries to combine high magic and high science, which does work for the most part, although I personally preferred the fantasy aspects if only because it fit the theological theme more. There is only one part where the science-fiction stuff is particularly egregious towards the end of the book, but all things considered it isn't too big an issue. I already know that I have the second book in the series queued up to read further down the line, and I'm looking forward to revisiting the world. I would be remiss though if I didn't mention an aspect of the writing that I found both distracting and uncomfortable. There was an awful lot of male gaze stuff, and it didn't really seem necessary. Sure, you can say that a female character is pretty within her character description, that's fine. The problem comes up when the narration regularly brings up female characters' plentiful bosoms and shapely legs. Hell, there's an entire section where the main character watches the magical equivalent of American Football with female teams. Sure it hits all the typical sports tropes, but adds comments about how the protective padding emphasises their feminine qualities, a section where a spell makes it look like a player is naked and some of the most stereotypical cat-fighting that I've seen in a long time. It's positively masturbatory and could have been cut quite easily. Admittedly, Zane does conduct himself in a gentlemanly manner, but even that becomes irritating with his tendency to assume that "female = purity". It's a shame considering that the world and the plot are really engaging. While I'm content to continue the series, I am sorely hoping that this was more an issue in the choice of main character, rather than something that is an author trait. I could see it souring my experience of what looks to be an intriguing series. Hope you are doing good. You have got an amazing book blog here, loved it. I am writing to you today, looking for an honest review of my suspense, thriller, sci-fi story-book "Time Crawlers", published on June 14, 2018, via Kindle Direct Publishing. The book is 118 pages long. Alien Invasion, Dark Artificial Intelligence, Time-Travel, High-Tech Hindu Mythology, Djinn Folklore, Telekinetics and life-consuming Cosmic Entities are some major themes in my book which has 6 tightly-knit, fast-paced Sci-Fi stories. Your precious words would be a very big help to me and help me write better books in the future. Please let me know if you would be willing to share your valuable review. I will share the PDF or MOBI as required by you. Please let me know how to proceed.